The importance of fungi as biological production factories is well known. Most of the worlds antibiotics are produced by fungi. They produce enzymes, for example to digest starch, but also metabolites. 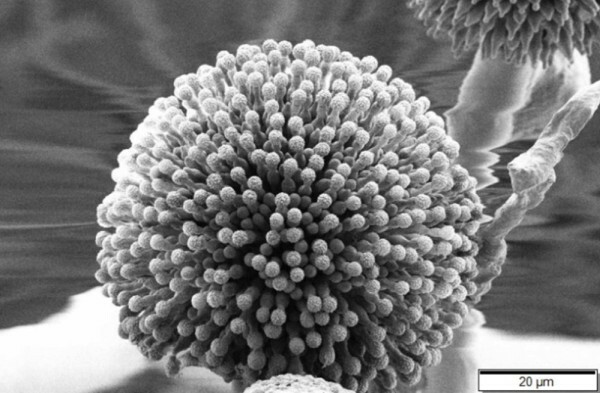 Aspergillus niger is one of the most well defined industrial fungi. It is a producer of citric acid, an acidity regulator in food. But it can also efficiently produce enzymes, in some cases more than 100 grams per liter biomass in a fermentor. Although well known, even A. niger is not completely understood. Marc van der Maarel, professor of carbohydrate bioprocessing at the Groningen University, found in a former IOP Genomics project that about a quarter of the amylase-type enzymes do not migrate out of the cells. I believe that these enzymes must have a function not only outside the cell but in the cells physiology, for example in the formation or degradation of carbohydrates within the cell, Van der Maarel explains. To find out, he started the new project DynaMyc from dynamics of the mycelium. The Molecular Microbiology group within the Institute of Biology at Leiden University studies the ageing of fungus cultures. When the mycelium ages, the cells lyse (die) and production capacity is lost. Benjamin Nitsche and Arthur Ram deliberately create an old mycelium and sample the cells over time. By analysing the RNA of the cells on a microarray, the expression of genes during ageing is studied. This also sounds easier than it is. You have to realise that not a lot is known about these processes. We are learning by doing as we go along, says Van der Maarel. By collecting more information on the action of the enzyme and protein network involved in the formation and break-down of the fungal cell wall, the production process may be improved, says Van der Maarel. Countries like China are increasingly important competitors in producing enzymes and metabolites. To sustain our economical competitivity, industry needs to improve the production process. By understanding the ageing process and the autolysis of cells, it may also be possible to improve the production of the cells. When cells lyse, you lose biomass, explains Van der Maarel. These cells do not produce anymore. By preventing or postponing autolysis, you can produce more with the same amount of biomass in the same fermentor, explains van der Maarel. Improving the production will be the direct result of the project, says Van der Maarel. But in the more distant future, the fundamental understanding of the actions of enzymes and proteins involved in cell wall synthesis and breakdown in fungi may lead to more advanced applications. Lysis-on-command is one of these. Van der Maarel explains: When you understand how enzymes break down the cell from the inside, which triggers start the cascade, you may be able to regulate that process. That means that you may be able to prevent the process from happening or to add a compound which induces lysis of the cells. The latter is useful when one of the enzymes that do not migrate out of the cells prove to be interesting compounds for industry and need to be produced on a larger scale. Instead of the usual industrial user group, the five partners in the DynaMyc project have formed a consortium. The difference is that the two industrial partners, DSM and Kerry, deliver their share of money and time, 1 and 0,3 fte respectively. When Marc van der Maarel had an idea for the succession of the first IOP-Genomics Aspergillus project, he talked to DSM and the University of Leiden first. The university of Utrecht quickly was involved and together they decided to ask Kerry in the project. Van der Maarel urged DSM and Kerry to reach consent about possible IP problems before signing the consortium agreement, which was signed after less than a year of negotiations. The interaction with industry is much more intense. This works very well, also for the students who learn about the ways industry works, Van der Maarel says. Dit artikel is gepubliceerd als IOP Genomics Factsheet van project nr. IGE 07008, maart 2009.